NEW YORK--(BUSINESS WIRE)--NIKE, Inc. (NYSE: NKE) opens its newest Nike House of Innovation, on Thurs., Nov.15 as Nike NYC: a 68,000 sq. ft., six-level, cross-category premium Nike store located at 650 Fifth Ave. Nike NYC is the pinnacle expression of modern retail, representing the best of Nike global product, experiences and sport innovation. 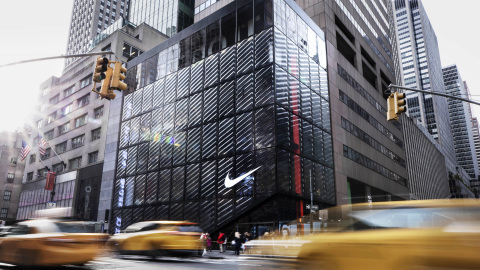 Nike NYC engages consumers with best-in-class digital and physical services combined with premium products, experiences and features to create a new benchmark for Nike retail. Powered by digital commerce data and inspired by Nike’s newest retail concept, Nike Live, the ground floor features the new Nike Speed Shop - offering on-the-go access to the products local members know and love most. Consumers can shop these uniquely curated NYC favorites alongside seasonal picks, visit the Nike Sneaker Bar for easy access to Nike’s biggest power franchise footwear, or they can reserve items in the Nike App and pick them up in the Speed Shop digital lockers. The fifth-floor is home to the Nike Expert Studio - Nike’s first dedicated floor to provide even more personal service to NikePlus members. 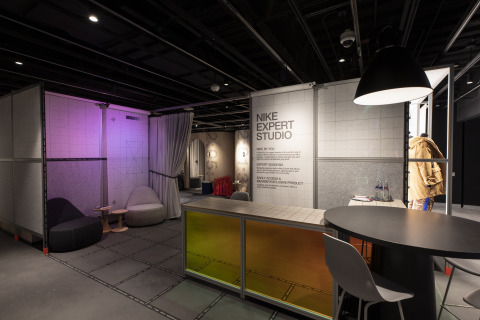 These NikePlus member-only experiences, like bookable sessions with Nike Experts and the Nike by You Studio provide a destination for members to access seasonally exclusive products, get 1-1 styling and create personalized products in an elevated experience. Powered by Nike digital commerce data, and inspired by Nike’s newest retail concept, Nike Live, the Nike Speed Shop delivers on-the-go access to NYC favorites. For men, there are Nike.com best sellers like the Nike VaporMax Flyknit 2 or Tech Fleece jogger, and for her, the Zoom Peg 35 and Classic Swoosh Sports Bra. 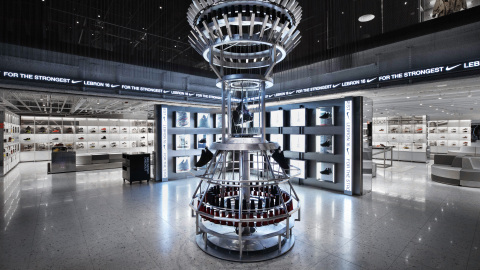 Easy to navigate shopping is also elevated with curated seasonal product picks along with service offerings like the Nike Sneaker Bar and Pick Up Lockers that allow NikePlus members to reserve items while shopping out of store, and have products held for them at an in-store digital locker. It’s the quickest way for local shoppers to access what’s most important to them. On the fifth floor Nike Expert Studio, consumers gain access to elevated service offerings through one-to-one appointments with Nike Experts (bookable through the Nike App or in-store). Whether gearing up to run their next marathon or looking for a more personalized styling session, NikePlus members can work directly with a Nike Expert to find their perfect product match. The Nike Expert Studio will also offer up a mix of key seasonal product alongside member-exclusives, as well as rotating, premium Nike by You services – from post-embellishment to cut-and-sew customization of Nike’s latest apparel launches at the Nike by You Made-to-Order Atelier. Brand defining, seasonal storytelling in its purest form will be based in the first floor Nike Arena, welcoming consumers into the store with towering digital displays and access to core pieces from Nike’s seasonal collections. At opening, the space will play host to a uniquely activated Nike by You customization space. 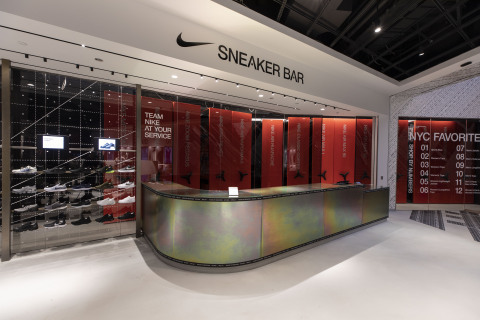 The Nike Arena is also home to the store’s Team Nike Service Desk, where NikePlus members can learn about in-store offerings, check in or book Nike Expert appointments; and where all consumers can make returns, checkout, schedule Courier Service and learn more about Nike NYC. 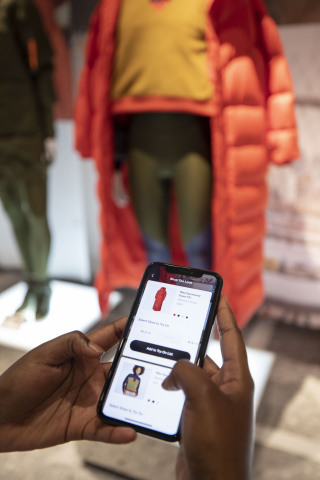 By scanning a QR code on an in-store mannequin, consumers can browse every single item on the mannequin, check to see if their size is available in-store or online and see available colors. Then with just a tap, they can request for select products to be sent to a fitting room of their choice or receive the items from a store athlete at a designated pick-up spot. Each shoe is finely crafted with white-on-white, high quality, bonded synthetic leather along with removeable Nike Swooshes to allow for more flexibility in customization. In the Nike Arena Nike by You Makers Studio, shoppers will have access to footwear dip-dyeing, footwear printing, embroidery, footwear patches, lasering and a full footwear accessory bar (laces, zippers, tongue tags, etc.). Select Styles and customization Exclusively Available at Nike NYC Beginning November 15 (or while quantities last). NIKE, Inc., based near Beaverton, Ore., is the world's leading designer, marketer and distributor of authentic athletic footwear, apparel, equipment and accessories for a wide variety of sports and fitness activities. Wholly-owned NIKE, Inc. subsidiary brands include Converse, which designs, markets and distributes athletic lifestyle footwear, apparel and accessories; and Hurley, which designs, markets and distributes surf and youth lifestyle footwear, apparel and accessories. For more information, Nike’s earnings releases and other financial information are available at http://investors.nike.com. Individuals can also visit http://news.nike.com/ and follow @Nike. For more information, including multi-media materials, please visit http://news.nike.com/.